Want to Be a Better Writer? Give Your Writing a Chance to Evolve. On the Internet, everyone dreams of becoming a celebrated writer. And thankfully, you don’t have to look far to find millions of articles jam-packed with tips and hacks to help you achieve that dream. I find, however, that most of these articles fall short of their promise. That’s because most of them focus on the writer’s process — what time they write, the apps they use, how they take their coffee — rather than any actionable tips about how to actually make your writing better. It’s much easier to share habits than it is to teach skills. 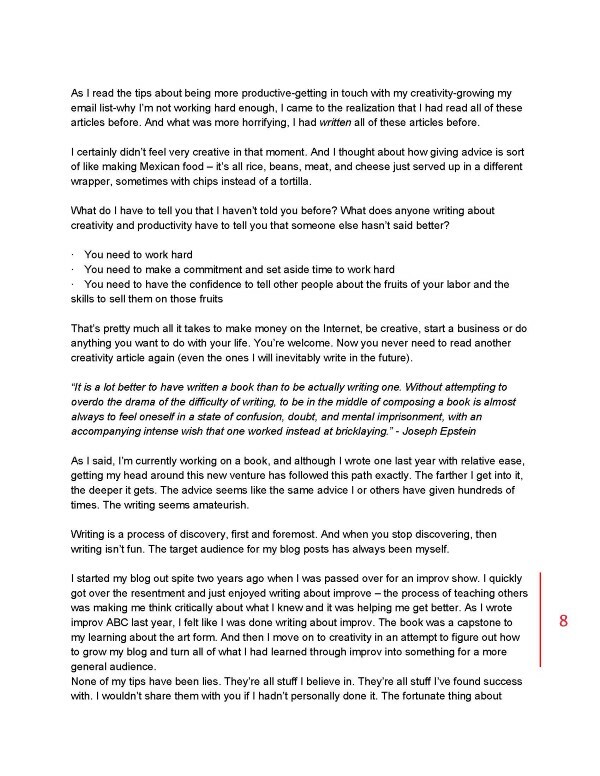 Before I started writing on Medium, I used to think my “three-draft” writing process was fairly unique. It involves, unsurprisingly, three drafts — a terrible first draft where I type everything on my mind, a more refined second draft where I focus on structure, and a third draft that’s for polishing and publishing. 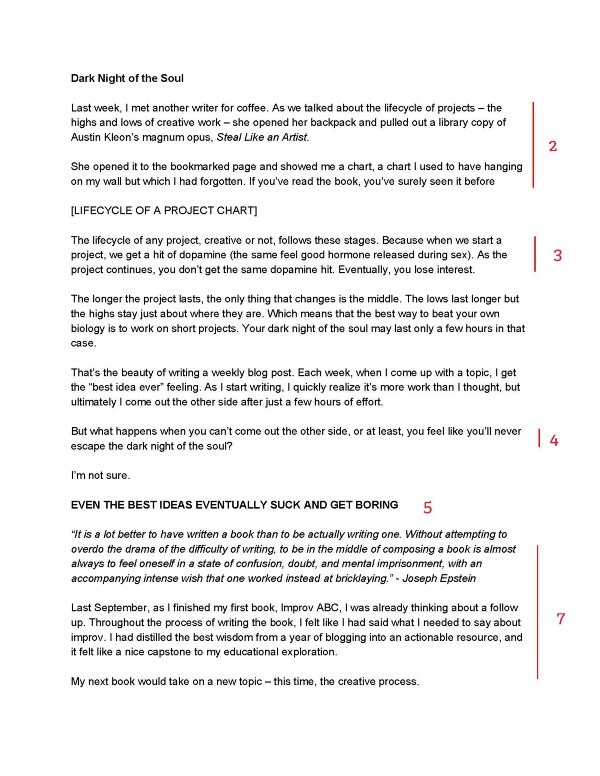 But with the explosion of “writing tips” articles, I’ve started to notice a bunch of other writers have come up with this exact same process. Guess I’m not a special snowflake after all. 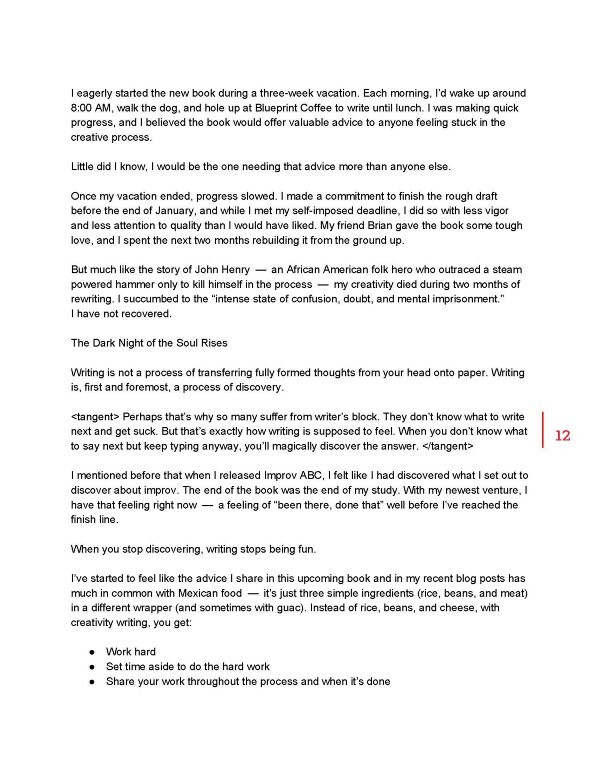 So rather than share another “writing process” article, I thought I might attempt to advance the conversation by helping you with the actual craft. In this article, I’ll take you through all three drafts of a fairly popular blog post I published back in April called The Dark Side of Creativity. Hopefully, seeing my drafts and the editing choices I made will help you refine your own writing. Let’s begin with a very brief backstory. In April, I was struggling to write my second book. I was frustrated and disappointed. A friend said that I should write about that inner-turmoil. He said people would be able to relate. Below is the first draft of that post — completely unedited. It’s not very good (which is why it’s the first draft). But the goal was never to make it “good” — the goal was to get all of the ideas out of my head and onto the page for future refinement. Go ahead and take a couple minutes to read the whole thing through — it’ll make everything that follows easier to digest. I don’t believe in writer’s block. As far as I’m concerned, writer’s block is a procrastination technique masquerading as a legitimate problem. Writer’s block is the result of poor planning. You can sit down and start writing so long as you have an outline to follow. Or simply by just starting writing, no matter how bad the writing is. What is real is writer’s breakdown. Most projects I work on have a pretty short lifecycle. For example, I come up with a blog topic over the week, write about it sometime during the week, and then post it the following Monday. And most of my blog posts are filled with positive messages and quick tips to boost your creativity — the same tips that I use. But I have been lying to you. I don’t live in a magical land where it’s always rainbows and butterflies. I don’t live in a land where I am always pleased as punch to sit down and write. I don’t live in a land where I’m always excited about my projects. And this week, I can’t be the creativity cheerleader. This week is my dark night of the soul. And I was. This is my dark night of the soul. Right now, I am not feeling very creative or inspired. Right now, I feel like I want to quit. Like I want to stop writing this blog, delete the third draft of my upcoming book, and start playing video games every night instead of hustle. This isn’t the first time I’ve felt this way, certainly. I go through ups and downs all the time. But this week, I feel worse than usual. I think it all started as I was reading yet another creativity/productivity/entrepreneurship/does it actually matter article on Medium.com. 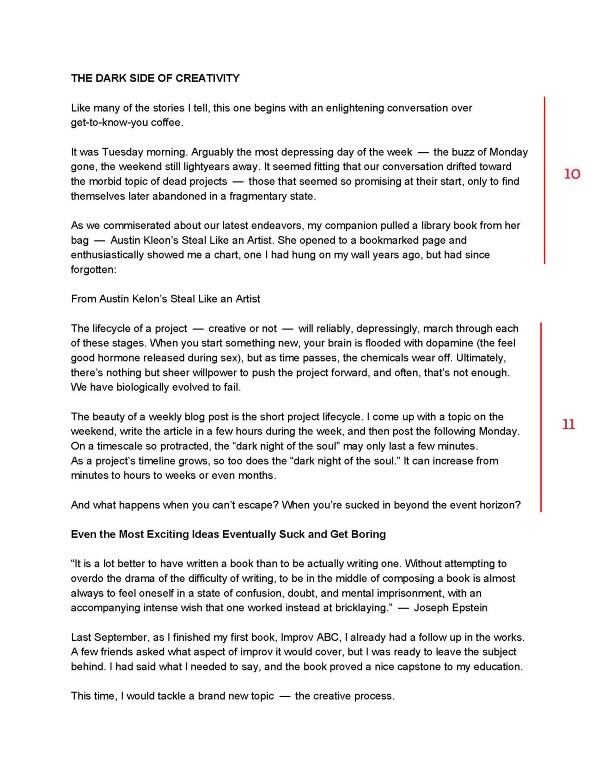 As I read the tips about being more productive-getting in touch with my creativity-growing my email list-why I’m not working hard enough, I came to the realization that I had read all of these articles before. And what was more horrifying, I had written all of these articles before. I certainly didn’t feel very creative in that moment. And I thought about how giving advice is sort of like making Mexican food — it’s all rice, beans, meat, and cheese just served up in a different wrapper, sometimes with chips instead of a tortilla. What do I have to tell you that I haven’t told you before? What does anyone writing about creativity and productivity have to tell you that someone else hasn’t said better? That’s pretty much all it takes to make money on the Internet, be creative, start a business or do anything you want to do with your life. You’re welcome. Now you never need to read another creativity article again (even the ones I will inevitably write in the future). As I said, I’m currently working on a book, and although I wrote one last year with relative ease, getting my head around this new venture has followed this path exactly. The farther I get into it, the deeper it gets. The advice seems like the same advice I or others have given hundreds of times. The writing seems amateurish. Writing is a process of discovery, first and foremost. And when you stop discovering, then writing isn’t fun. The target audience for my blog posts has always been myself. I started my blog out spite two years ago when I was passed over for an improv show. 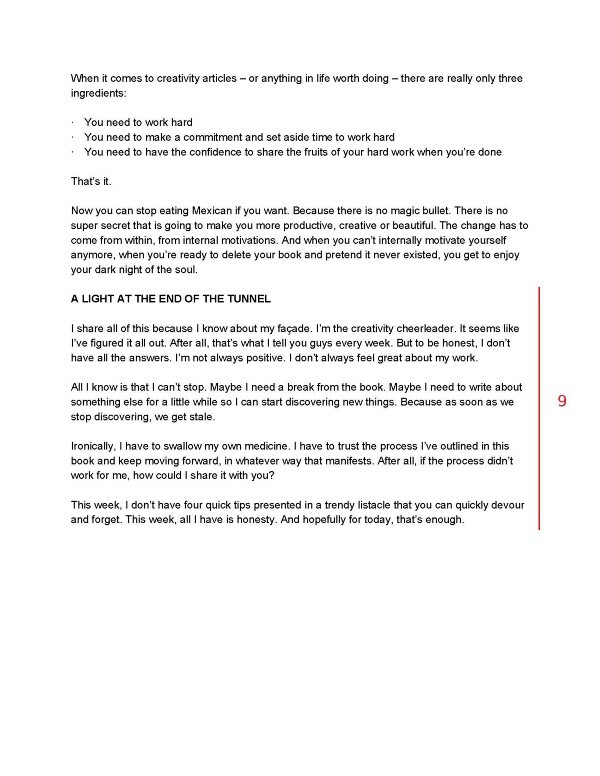 I quickly got over the resentment and just enjoyed writing about improve — the process of teaching others was making me think critically about what I knew and it was helping me get better. As I wrote improv ABC last year, I felt like I was done writing about improv. The book was a capstone to my learning about the art form. And then I move on to creativity in an attempt to figure out how to grow my blog and turn all of what I had learned through improv into something for a more general audience. None of my tips have been lies. They’re all stuff I believe in. They’re all stuff I’ve found success with. I wouldn’t share them with you if I hadn’t personally done it. The fortunate thing about Improv ABC was that it was short and structured. I moved through it quickly and never had to dip into the “dark night of the soul” portion of the chart. This new book has taken significantly longer, and the dark night of the soul has sucked me in. 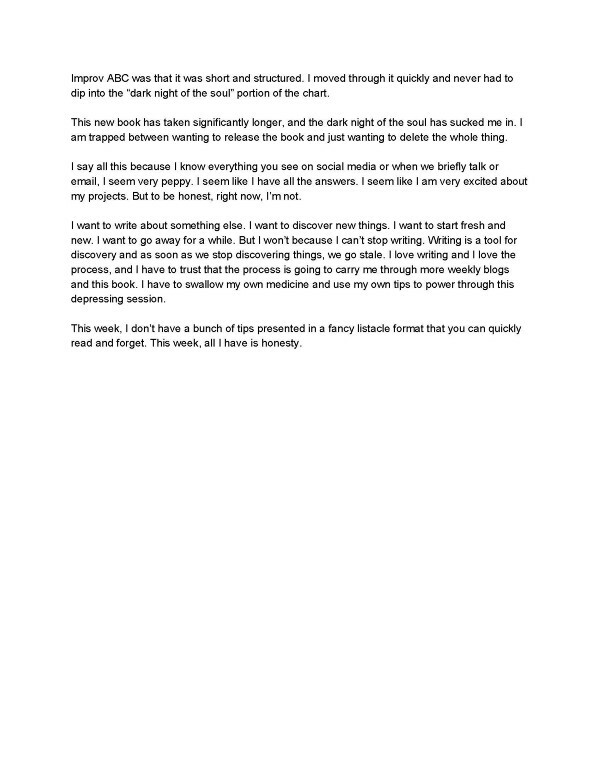 I am trapped between wanting to release the book and just wanting to delete the whole thing. I say all this because I know everything you see on social media or when we briefly talk or email, I seem very peppy. I seem like I have all the answers. I seem like I am very excited about my projects. But to be honest, right now, I’m not. I want to write about something else. I want to discover new things. I want to start fresh and new. I want to go away for a while. But I won’t because I can’t stop writing. Writing is a tool for discovery and as soon as we stop discovering things, we go stale. 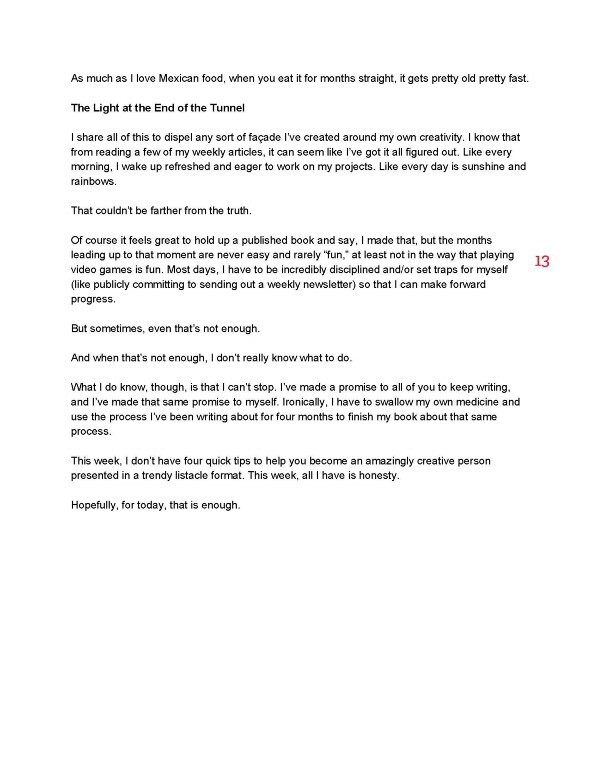 I love writing and I love the process, and I have to trust that the process is going to carry me through more weekly blogs and this book. I have to swallow my own medicine and use my own tips to power through this depressing session. This week, I don’t have a bunch of tips presented in a fancy listacle format that you can quickly read and forget. This week, all I have is honesty. Now that you’ve read the first draft, let’s compare it, side-by-side, to the second draft. I’ll point out some obvious differences between the two and explain the thought process behind those changes. Quick note: First draft on the top, second draft on the bottom. Scroll down to see the commentary that aligns with each number. The intro was long-winded and self-indulgent. It buried the lead. 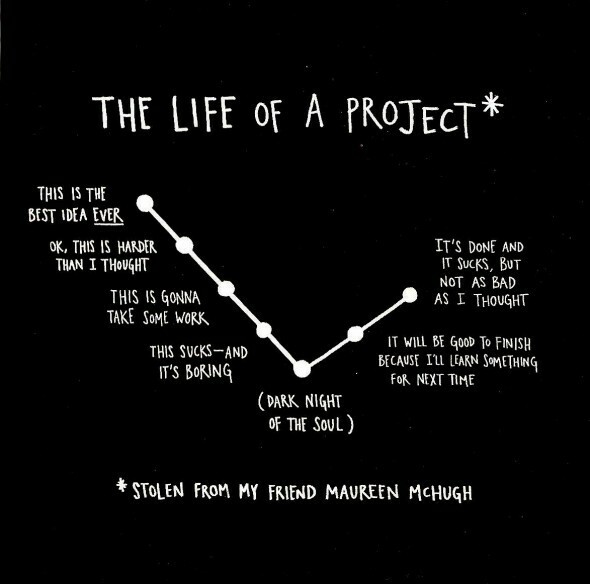 The article really begins with Kleon’s chart that explains the concept of Dark Night of the Soul, and I needed to get there faster. The story about meeting a friend for coffee and seeing the chart was an afterthought in the first draft. In the second draft, I realized how central that was to the story, so I decided to feature it more prominently. It was also a much more interesting lead. 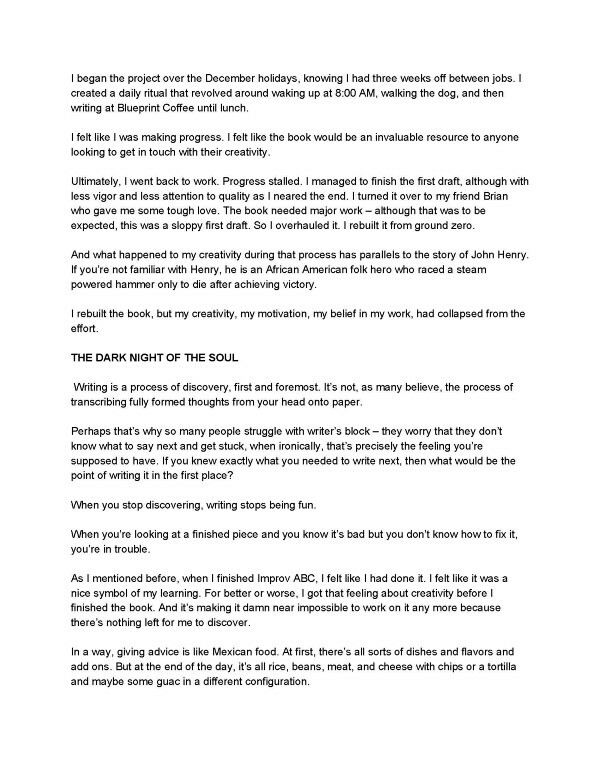 I did a bit of research into the psychology of why the Dark Night of the Soul is such a common feature of the creative process. I included that here. In the first draft, this key question is buried because the post is very me-focused. I wanted this central question to be crystal clear in the following drafts to shift the focus from my own issues to helping the reader grow through my own experience. The second draft is primarily focused on structure. This is the first of a few section breaks I added to help readers more easily progress through the article. This entire section is a self-indulgent rant. It was a necessary part of the first draft because it led to more relevant, important insights further down the page. But it has served its purpose. It has no place in the following drafts. What follows is essentially a flip of what I’d written in the first draft. Originally, I started with the Mexican food metaphor and followed it with how I came to that realization. In the second draft, I realized that was backwards thinking— the reader should logically follow my own thought process, meaning I needed to start with the personal journey and end with the discovery that led to. 8. All of this backstory is irrelevant and has nothing to do with that central question I highlighted in note 4. 9. I really liked the ending of the first draft. While I did make it a bit more concise, the content delivers an almost identical message. The second draft is wildly different from the first. That’s because this step is all about taking those unstructured ideas I discovered earlier and organizing them into some sort of structured and coherent narrative. Quick note: Second draft on the top, third/final draft on the bottom. 10. I expanded the story opener and upped the drama to draw readers in. In hindsight (or a fourth draft), this should have been shorter. 11. Again, the same content as the second draft, but the writing is more polished. 12. 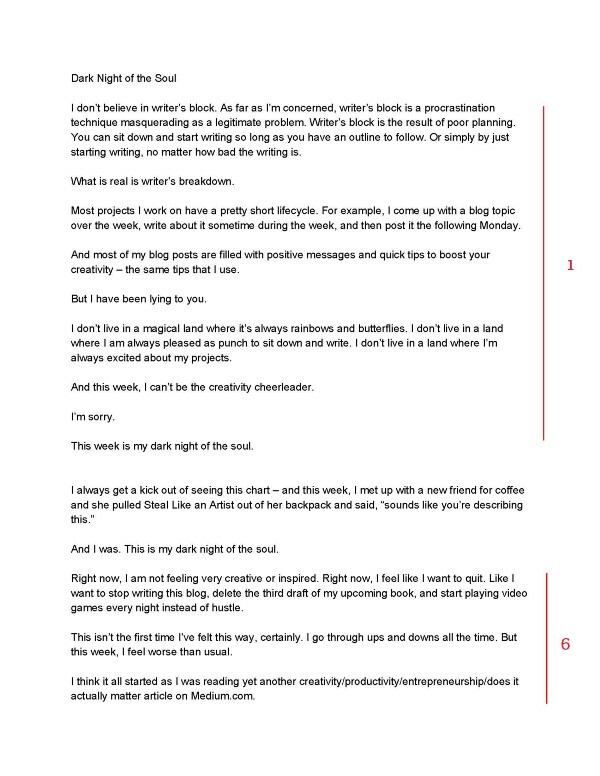 I wanted to leave this idea of “writers block” in the article (echoes of the first draft intro), but I wasn’t sure where it fit. I made the lazy choice of including it as a parenthetical tangent rather than finding a true place for it or cutting it. 13. Here, I added a bit more of my inner monologue to drive home the point that while it may seem like I have everything figured out, I struggle with the same challenges as every other aspiring creative (which is really what the article is about). But otherwise, the ending is almost unchanged from the first draft. The third draft isn’t a huge departure from the second, but you can definitely feel the difference in tone. It’s much smoother, more polished, and more dramatic. Every writer has to start somewhere. And every writer has to stay motivated along the way. Social media and Medium make it all too easy to compare your garbage first draft to someone else’s final, and that’s a recipe for disaster and discouragement. So rather than tell you about where I write or what time I write, I’d rather share my drafts to show you how I actually write. That my first attempts, like yours or anyone else’s, aren’t very good. Give yourself the time and permission to live with your work. Give your writing a chance to evolve into something worth reading. So, You Want to Be a Copywriter?